Ajmer is a city of cultural, historical and religious importance in India. Its royal palaces, invincible forts and finest temples make it one of the most popular tourist’s destinations in the world. The second largest city of Rajasthan, Ajmer has always been a flourishing place for arts, architecture and crafts. In last few years, the tourist influx has grown at an unprecedented rate in the city. The city has expanded well beyond the confines of the forts. The land is thriving with trades, services, hospitality and residents. As such, the need for an efficient taxi service has arisen now, more than ever. 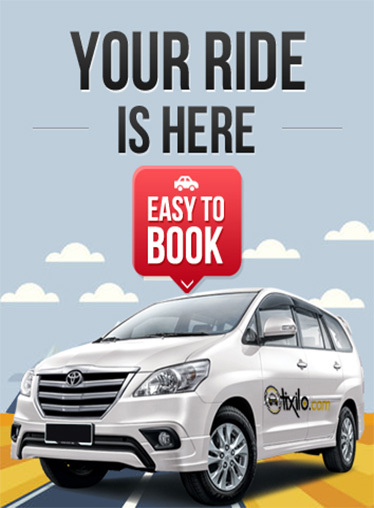 At Tixilo.com, we understand the need of a secure, comfortable, and timely ride for the commuters. Therefore, we endeavour to provide the best in class taxi services that are not only safe and prompt, but are also reasonably priced. We have a well-organized taxi cab network that ensures that you will get a quality ride even to the farthest reaches of the city. Whether it is the tourist attractions, bus stand, railway station, airport or hotel, we offer car rental Ajmer services to ensure hassle free travelling throughout the city. Moreover, we also provide car rental services for out of station travelling. Our fair and competitive rates and fully equipped cabs ensure a smooth ride and one hundred percent customer satisfaction, no matter how long the journey is. Why Choose Tixilo Car Rental Services in Ajmer? We take pride in our ability to provide you a relaxing and safe commute, wherever you want to go. We provide fully equipped cabs and our drivers are highly trained and educated. Here is why you would want to choose Tixilo.com for car rental Ajmer services, as soon as you reach the lands of ‘Sun City’ Ajmer.